A member of the firm negotiated a 25 year sale/leaseback with Bell South (now AT&T). 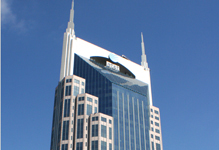 The Bell South Building, the tallest building in Tennessee, is a 690,297 sq. ft., 32-story Class A office building constructed in 1994. There is also a two-story economic development center on the premises. The Property is located at 333 Commerce Street in downtown Nashville, in the heart of the central business district.